Most of us realize that the universe is basically chaos stretching in every conceivable direction, and that there’s no such thing as true permanence or stability. But there’s something about the human experience that makes us want to seek refuge in whatever feels reliable and enduring. 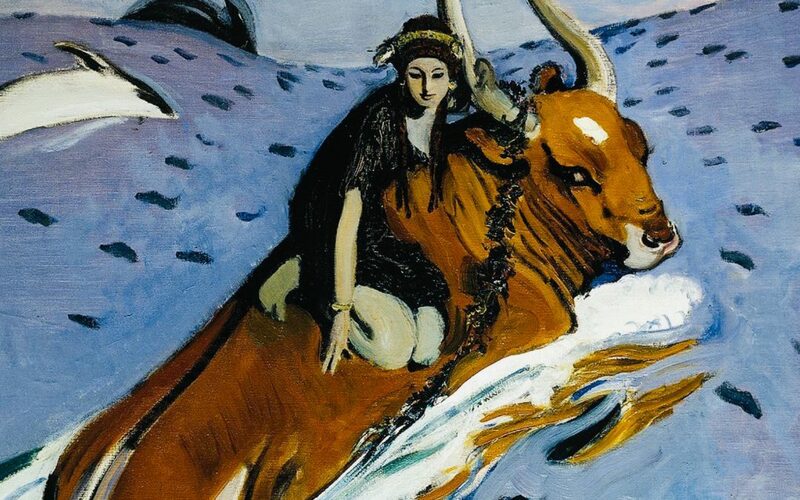 If Taurus is kind of like the rock that anchors you, and the moon is a mood, then this moment is probably going to be predicated on whether we have a sense of security we can hang our hats on. And regardless of whether we do or we don’t, we’re still probably going to feel the proximity of all the turbulence that’s constantly pulsing beneath our feet. This year’s Taurus Full Moon is closely conjunct unpredictable Uranus, and it’s also part of a tense grand cross formation in a stubborn-AF fixed sign modality. The ruler of this moon is Venus, who is currently retrograde in Scorpio and is sitting with the Sun, opposite the Moon and Uranus. And then there’s the two nodes, which are squaring that opposition. A Venus/Saturn sextile does help pave the way for a mature, productive outcome, but it won’t totally negate the sense of feeling pulled in many directions at this crossroads. A grand cross is kind of like four dinner guests with contrasting sets of demands all fighting for a piece of the tablecloth. If they all dig in their heels, the cloth gets torn to shreds. But if they manage to strike some sort of accord and agree to settle for a state of perfect moderation and balance, then the cloth stays intact and they can become an unstoppable force together (of eating, I guess? It’s a Taurus moon so I guess this metaphor is appropriate). Because we’re dealing with a fixed cross, the sort of flexibility required to make this a productive aspect will be especially hard to come by. These are deeply ingrained patterns and habits that we’re being asked to change and adjust at this moment in time (like our need for control, maybe) — as well as things about ourselves and our lives we might feel we must preserve at all costs. Venus and Uranus are building up to an exact opposition on Halloween, but this mounting tension is a big factor in what’s currently coming up for inspection. It’s possible that our changing tastes, values, and preferences are part of what’s freaking out the Taurus Moon so much at the moment. Taurus is a creature of habit, and it pretty much just sticks to what it knows it likes. But Scorpio would rather turn itself inside-out in its desire to transform completely. With the nodes also in play, there’s a make-it-or-break-it sense that we’re either going to embrace the call of destiny and our highest growth right now, or slip back into our cozy old habits. But it actually seems like the better answer might be figuring out how to do both. It might be possible to bring the best elements of whatever we’ve fully mastered in Aquarius into the fold as we lean into whatever’s still kind of uncomfortable to us about Leo. Leo and Aquarius are both about “being yourself,” but Leo has a need for validation and approval that Aquarius mostly lacks, and Aquarius can sometimes flaunt its edginess and contrarian opinions for the sake of shock value, not for expressing itself authentically from the heart (which Leo happens to be good at). Unfortunately for the Taurus Moon, it doesn’t seem like luxuriating in place is really a viable option right now, but if anything, this just means we’ll have to reach for something way more unfuckwithable as we roll with the punches of whatever’s going on for us externally. And that’s the sense of security we carry with us inside.